← Fresh Breath and a Fully Charged Phone! First boys colored their dragon drawing (printed from the colAR Mix app), and then listened to a brief introduction on how to hold the iPad for the image to appear. 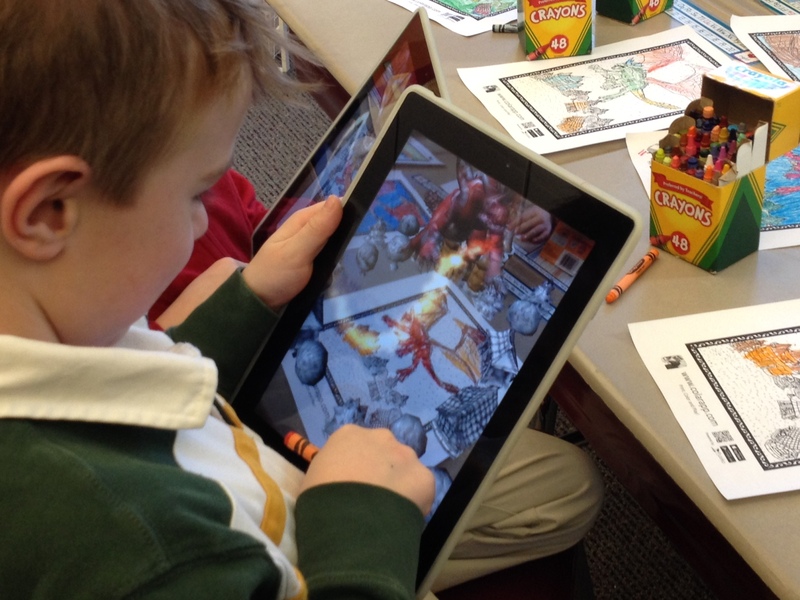 This was the first time this app was used in the classroom and we discovered that some of the pictures would not engage the software to produce a 3-D image; but boys colored new dragons and everyone gained success. When we ended the activity, we sorted the pictures into ones that worked and ones that didn’t. As Nicole has time, the boys are going to examine the different images to see if they can discover the difference between those that worked and those that didn’t. They will look for patterns and develop hypotheses to test with the app during their free time. Check back for their recommendations on how to color the drawings so that they will be successful with the colAR Mix app! This entry was posted in Creativity, Featured App. Bookmark the permalink.